CM-700d/600d: Compact, lightweight spectrophotometers with wireless communication and color LCD screen, offering excellent portability and operability! We are surrounded by abundant colors. In the automotive, home appliance, portable phone, textile and clothing industries the variation in colors are increasing in order to differentiate products. In the food industry, the importance of color management continues to rise. Under such circumstances, the applications of color-measuring instruments have been rapidly spreading from R&D or QC departments to production sites, as well as from product manufacturers to parts/material suppliers. The CM-700d/600d is a spectrophotometer that has achieved a much more compact and lightweight body while retaining the sophisticated functions of Konica Minolta's conventional models by utilizing our original optical design and signal processing technologies. 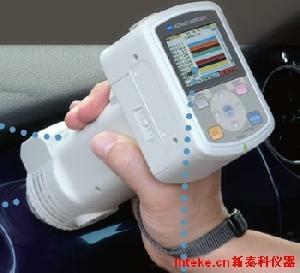 It allows easy and accurate color measurement in various sites and occasions. The easy-to-read color LCD screen allows intuitive recognition of measurement results. Experience the ease for yourself!